And! I don’t even like oranges. I don’t even care about orange flavored things. Those chocolate covered oranges that are out right now, around the holidays? Ohhhhh heck no. Don’t even come near me. The only thing that gets me REMOTELY close to those is when I dip clementine wedges into ganache. That I can do. BUT. There is just something so wonderfully nostalgic and Christmas-y for me about the orange cinnamon combo. And yes, of course it stems from those fabulous orange rolls right out of a can. Confession: as I was sharing my orange cinnamon pull apart bread on instagram the other day? I declared that I was going to buy the orange cinnamon rolls from a can for the holidays. I said it. Really I’m just a nostalgic freak. 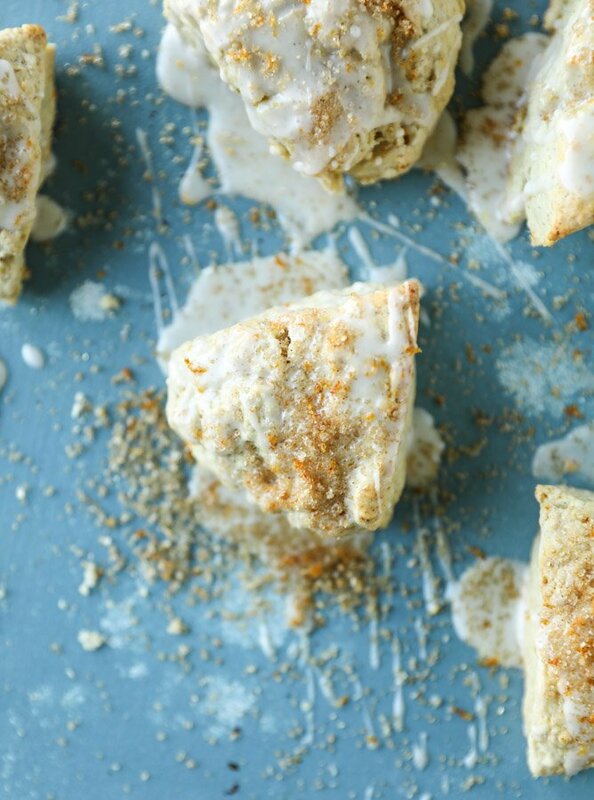 Instead of wasting my money on that stuff in the can though, I should probbbbbably just make these adorable mini scones. They’re mini. So you get to eat more! So good at math. Yes I am. This is basically one giant hypocritical recipe because you probably know by now that scones are also not one of my favorite things. Unless I use this fantastic recipe. I think we can officially say I’m a holidazed mess. Look at these adorable little triangles. Drizzled with delicious orange glaze. 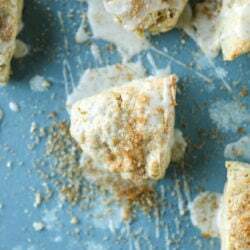 Sprinkled with crunchy, coarse orange cinnamon sugar. And yes, I totally think you can make the dough the day before, refrigerate it, then slice and bake come morning. This is the best gift ever! Also craving that like whoa. if you eat them standing up – no calories at all!! tada! Awww! Anything mini is better but the fact that these are scones is making me want them as soon as humanly possible! These scones look amazing! I’m preggo right now and can hardly eat anything without getting sick – fun stuff, BUT, oranges (which I really never liked before) are one thing I can stomach, as well as those mini vanilla scones from Starbucks – so these are like two of my faves combined, definitely going to make these stat! We ate those orange cinnamon rolls too! I didn’t even know there were “regular” cinnamon rolls till, like high school at least. Ha. My husband thinks they are gross but I have definitely bought those delicious processed loves a time or two over the years. You know, for nostalgia sake. These look super tasty and much more grown up! These look delicious! Doing tea time with my mom is one of my favorite memories so I am such a sucker for scones! These look fantastic, and i DO like orange things! Trying these! Amazing recipe and I have bookmarked the tab for future reference? hey Jessica! These look so yummy. Do you think they’d taste just as good without the orange? Local oranges in Uganda are quite sour, so I made these with lemon and ginger – and they were just as fabulous! I made these for my annual New Year’s brunch and they were a big hit. Beautiful looks and not too sweet. I had to add extra buttermilk to flour that was superdry thanks to our ridiculous low temperatures and accompanying low humidity. Like you, Jessica, I don’t love oranges but this has a really nice combination of flavors. Also, if you want these to be the mini version, be sure to separate the dough into three rounds instead of two. I did the two and I ended up with regularly sized scones. Love oranges and it looks nice, however, I’m thinking going light on the icing.